Ugh. I’ve been battling an ugly head cold for about a week now and it completely knocked me out. Like, come home, put on jammies, curl up on the couch with my eyes half closed knock out. I think I’m finally starting to feel better. Maybe I’ll even skip the Dayquil today. Maybe. Last year, Dan and I were able to take some time off from work around the holidays, but before the actual holiday craziness commenced. We spent that time doing fun things like trying out new restaurants, visiting a Christmas market downtown, seeing movies during the day, and shopping without crowds. It was glorious. While downtown, Dan asked if we had time to run over to Magnolia Bakery to grab one of his favorite treats – Banana Pudding. We were only a few blocks away, so I thought, sure, why not? I’m not a huge banana pudding fan, but Dan swore it would be delicious. As much as I hate to admit it, he was right. The creamy texture was actually quite light, and the subtle taste of banana was amazing. I thought I’d try my hand at making the banana pudding myself, to enjoy as our Valentine’s Day dessert. I did all sorts of googling and pinteresting and was surprised that the recipe was fairly easy to come by, and it was even given in The Complete Magnolia Bakery Cookbook. All the recipes were identical, so I followed the recipe to a T.
I made the pudding the night before I needed to serve the pudding. It sat in the fridge overnight. Then, when I went to make the rest of the dessert, I followed the recipe and layered the wafers, bananas, and pudding. Now, here’s where I’d diverge from the instructions the next time I make it. The recipe said to let everything chill together for four hours, so that’s what I did. The result was good, but not great, banana pudding. It didn’t taste exactly like the kind from Magnolia, and I was a bit disappointed. The next day, Dan got out more of the pudding to eat. I didn’t want any, but after he took one bite, he urged me to try some. It turns out, the pudding needed more time to sit and soak together. The Day 2 pudding knocked Day 1 pudding out of the water. There was the famous banana pudding! I guess the secret is to let all the flavors mix and wait for the vanilla wafers to become super soft. Day 2 will give you peak banana pudding. Day 3 was still tasty, but it paled in comparison to Day 2. Be sure to leave enough time for Day 2 before serving! PS – The recipe makes a whole lot more than shown. Like, a whole 2.5 quart glass pyrex bowl more. 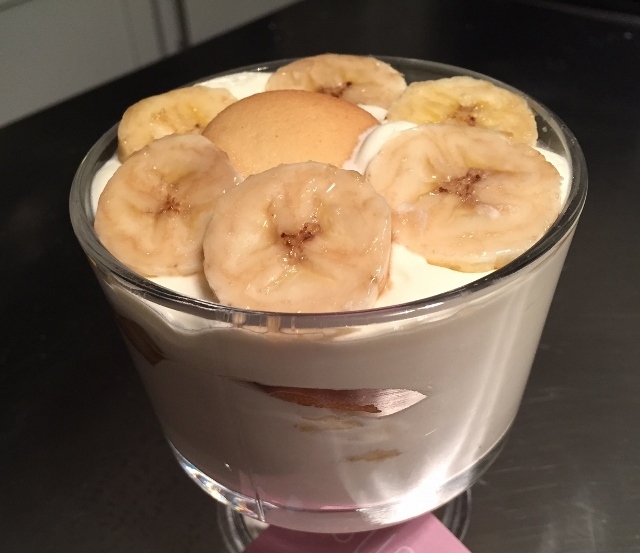 PPS – Here’s the exact recipe I used, but all recipes for Magnolia banana pudding that I found were the same.